Giuseppe Maria Crespi was the most outstanding, late Baroque artist in Bologna. He worked in oil and fresco and also produced book illustrations. Crespi executed religious paintings, particularly towards the end of his career, as well as mythological scenes, portraits and genre paintings, and his most important works fall within the the latter category. Crespi trained in Bologna with artists including Domenico Maria Canuti and Carlo Cignani, in addition to Gian Antonio Burrini with whom he worked as an assistant and through whom Crespi met his first patron, Giovanni Ricci. Crespi also made a careful study of the work of artists such as the Carracci and Guercino, as well as Titian and Veronese. He travelled to Venice, Emilia and the Marches. Crespi was involved in the founding of the Accademia Clementina in Bologna in 1710, becoming its director. Among his projects as an illustrator are the prints for the celebrated volume by Giulio Cesar Croce, Bertoldo e Bertoldino, which Crespi designed in the second decade of the century. 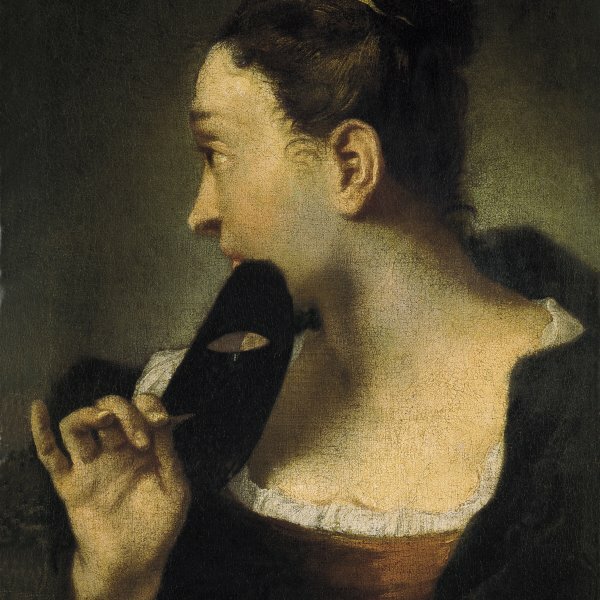 This large portrait was in the Salina Amorini collection in Bologna, entering the Thyssen-Bornemisza collection in 1974 from the Swiss art market. Together with other 17th- and 18th-century Italian paintings, the canvas was displayed in the entrance hall of Daylesford House, the residence of Baron and Baroness Thyssen-Bornemisza, in the 1980s. 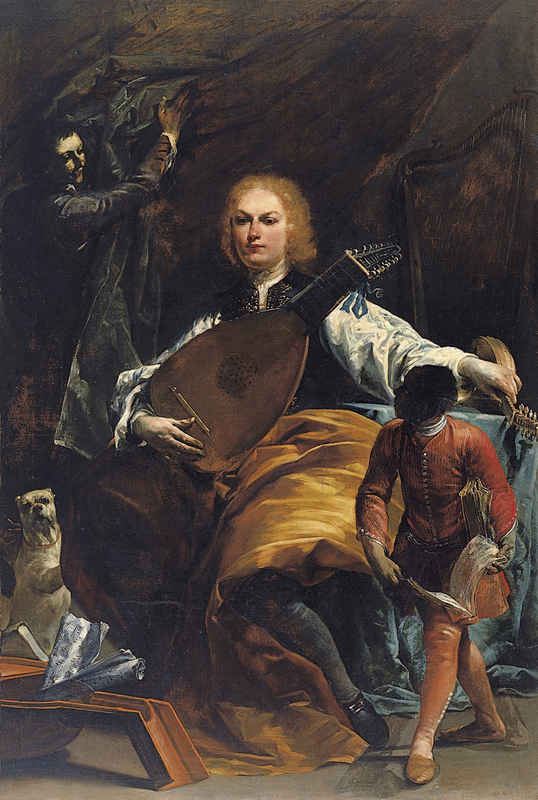 Through the choice of objects included in the composition, Crespi indicates the sitter’s interest in music, an art form that is also present in a number of other paintings by the artist. The impressive, large-scale figure of Fulvio Grati with its theatrical illumination provides the focus point for the painting. The sitter holds a lute that rests on his lap while his other hand rests on a table and delicately grasps a small mandolin. The Count is accompanied by two servants, of which the one behind him holds up a very large curtain that acts as the backdrop to the principal figure, while the richly dressed black page in the foreground on the right holds a number of musical scores. The position of that figure was corrected by Crespi to judge from the pentimenti to be found on the level of his right leg and left arm. Crespi’s skills at still-life painting are evident in a large number of his paintings and are to be seen here in the lower left corner of this large canvas.We see a still life consisting of the case of the lute, some loose sheets of music and a book, behind which is a small, seated dog looking curiously out at the viewer. The painting is constructed with a pronounced chiaroscuro in which the principal figure stands out strongly. He is also emphasized by the colours of the clothes and textiles including the gold cloth over his knees that is more eye-catching than the page’s salmon pink costume. The setting and position of the sitter’s arms have been compared with Crespi’s portrait of General Palffy in the Dresden Gemäldegalerie. Roberto Contini saw similarities with The Continence of Scipio in the Chrysler Museum, Norfolk, and also suggested that the present work was possibly a pair to the canvas known as The Hunter now in the Pinacoteca Nazionale, Bologna.